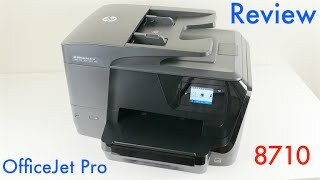 The officejet pro 8710 all-in-one printer Printer is manufactured by Hp and was added around May 2017. This version of the Printer comes in Color : White , Refresh Rate : 60 HZ , Printer Type : Laser (Color) , Watts : 35 mAh , Dimensions : 520.7 x 533.4 x 308.1 mm. The best price for the HP OfficeJet Pro 8710 All-in-One in Nigeria is ₦ 55900 sold at Jumia and available with free shipping and delivery within 1-6 Days (Fashion Items) 3-8 Days for other products. By comparing prices and buying from the cheapest store you can save up to 22% or ₦ 15400.